TPC Overall Rank: #106 out of 2933 rides. In User Top 10: 116 times. User Tracker Count: 340 times. Back at Great America, Vertical Velocity was my FAVORITE ride and I said nothing could quite compare to it (even the overrated Raging Bull). However, when you go to Cedar Point, Wicked Twister is still better than Vertical Velocity and yet it is still not the best coaster at the park. Conformity? It has the same track/similar OTS as Maverick (albeit Maverick has a wider OTS), so you can be the judge. I find it smooth but jerky at points since you are just going straight up and going straight down. Now Twister is one of the rides at the park, where if you are disappointed with the coaster itself; the view on it will make up for some of that dissatisfaction (also ride Force/TTD/Gatekeeper for views as well). Now here is the cool part; most impulse coasters only twist at one spiral, however this twists at both, which adds to the thrill. 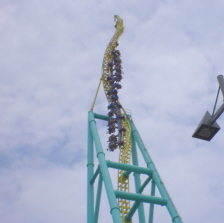 While not scary (I do not find any ride at Cedar Point downright terrifying), it is VERY intense for the ascend and twist on both spikes. Launches I have gotten used to, especially thanks to Dragster for prepping me with its 120 miles per hour. The lines on this one is very short so ride while you can! Very Fun, fast ride. Great Airtime on twists. and very short line, when i went. From the sound to the music to the high-speed launch, this was a perfect ride! I rode up front on the last ride and swore we were gonna fly right off the track! A great coaster, I would ride it again in a heart beat. This is my favorite ride at cedar point, I feel that this is so much different from all the other intamin impulse coasters because this one really gives you a jolt when your being launched. I also like this one more than the others because it has twists on both sides. My second Impulse coaster, and it was a blast. I sat at the very back and up the back spike on the second time, you go higher than the front spike. You think the train will crash through the track, but it doesn't. Love this ride. Usually there is no super long wait longer then 30 min. on busy days but its totally worth it. Wicked Twister failed to satisfy me. It may be taller, faster, and more twisted than all the other Impulse coasters, it isn't as fun of a ride as the rest. Intamin's biggest mistake when making this ride was twisting the back tower. One of the most exciting moments on a standard impulse coaster is when you're looking straight down, and as you are about to fall, the holding brakes grab you and you sit still as the tower sways. Unfortunately, that is an element Wicked Twister lacks, so other than the launch, this is a pretty boring ride. Wicked Twister is defintely more underrated than it should be. The ride starts with a satisfying launch pushing you into the first set of spikes, as you slow down you feel weightless as the coaster starts to now go backwards, the backwards launch pushes you againts the restraints and if you&#39.re in the back you can really feel the twisting on this spike, then you get launched yet again and spiral up the massive spike, then you go back yet again for my favourite part of the ride, if you&#39.re in the back you never know when you&#39.re going to start to spin but eventually you do and your twisted around with amazing speed and then you slow again after the 450 degree spiral and get some airtime and then yet agains piral out of control with great speed and intensity down and into the station, you slow and go a bit up th forward spike and then return to the station! Wicked twister should definitely not be over looked at Cedar Point as it is an extremely fun and intense ride! I have to agree with everyone else that this ride has the perfect setting. I have ridden this ride just once back in 03. I was a little dissapointed in the launch, but that was probably b/c i just rode TTD a few hours earlier. I didn&#39;t get much spinning on the ride since I was towards the middle. This ride deserves a 8 in my book primarilry b/c of the speed, weigthtlessness and the really short wait.